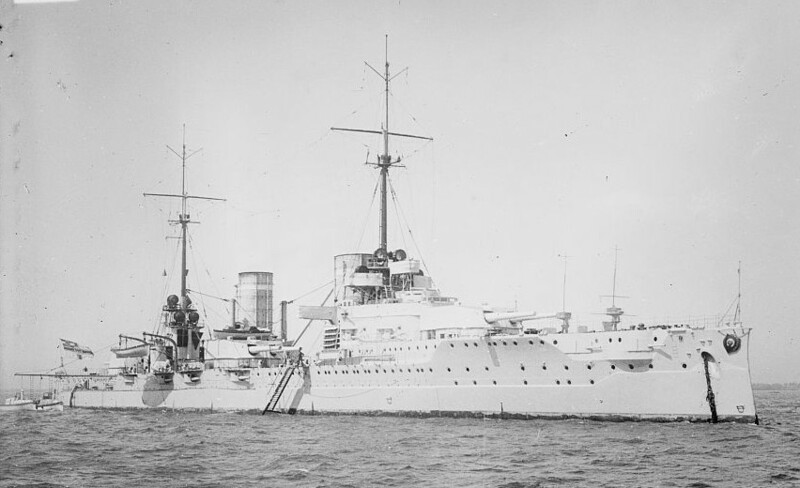 Battlecruiser Von der Tann. Note 8.8 cm bow chaser guns. Bain News Service Photograph. Library of Congress Photograph ID LC-DIG-ggbain-16927. Battleship Westfalen. Bain News Service Photograph. Library of Congress Photograph ID LC-DIG-ggbain-25466. These guns were used to arm Germany's first "Dreadnought" type battleships and battlecruisers. The battlecruiser Von der Tann used these weapons to sink HMS Indefatigable at the Battle of Jutland (Skagerrak). During World War II these guns were used only as coastal artillery. They were then supplied with a lighter shell with a larger propellant charge for increased range. Constructed of A tube, two layers of hoops and a jacket. Used the Krupp horizontal sliding wedge breech block. ^The often-seen figure of 117,947 lbs. (53,500 kg) for this weapon actually includes the weight of the Weige (gun cradle). For sketches of the projectiles and propellant fore and main charges used with these guns, please see the 28 cm SK L/50 datapage. ^These figures are from "German Warships 1815-1945" but there is no explanation given for the 1915 increase in range. The above information is from "Die Geschichte der deutschen Schiffsartillerie." ^The Drh LC/1906 mountings used electrically powered training and elevation gear. Lower hoists did not rotate with the gunhouse. ^Posen and Rheinland used LC/1906 for beam turrets and LC/1907 for end turrets. ^The Drh LC/1907 mountings used electrically powered training gear but the elevation gear was hydraulic. Lower hoists rotated with the gunhouse. Shell rooms were below the magazines in the battleships. On Von der Tann, the bow and wing turrets had the magazines above the shell rooms but the stern turret had the magazine below the shell room. Following the Dogger Bank action, German mountings were modified to improve flash precautions. Double flap doors were installed at the beginning and end of the cartridge hoist and ready ammunition was removed from the gun houses. Gun axes were 89.4 in (227 cm) apart.